"My party's name is Makkal Needhi Maiam (roughly translated to People's Justice Centre)," said the 63-year-old Kamal Haasan, standing at a giant stage near the just-unveiled party flag that symbolises the party's Dravidian ideology that puts people at its core. Superstar Kamal Haasan announced the name of his new political party, Makkal Needhi Maiam at a massive function in Madurai, seen as Tamil Nadu's political capital, where he shared stage with Delhi Chief Minister and Aam Aadmi Party chief Arvind Kejriwal, who was the chief guest for the evening. "This is not a one-day thing. This is a long-term goal... I am here to stay," the popular star said, adding, "I think the award for all this patience is all the allies and friends I have. One among them is Kejriwal." Mr Kejriwal had flown into Tamil Nadu just a few minutes earlier and spent much of the evening by his side, listening to his plans for the states and asking people to vote for Kamal Haasan as well. But there are other friends as well. Kerala Chief Minister Pinarayi Vijayan, who later delivered a recorded video message to the people. "This is a party for the people... 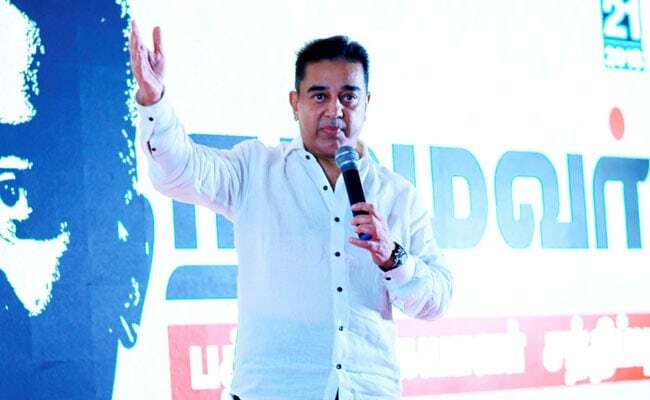 I am not a leader but a follower who would listen to your suggestions," Mr Haasan said to loud cheers from the tens of thousands of people who had gathered at Madurai's grounds. Mr Haasan, who plans to launch a mega tour of the state to reach out to people, promised that there were going to many such political meetings. "This is just a sample," he said. Mr Kejriwal who spoke later asked people to overwhelmingly vote for Mr Haasan's brand-new party if they wanted a corruption-free government. Else, there was always the AIADMK and DMK that they could vote. As he gathered new political friends ahead of the launch, Kamal Haasan has already signaled who he will not befriend. Tamil Nadu's ruling AIADMK for one; he called the party "bad" yesterday explaining why he had not met any AIADMK leader ahead of his political plunge. He met DMK chief M Karunanidhi, DMDK's Vijayakanth and also Tamil Nadu's other superstar now poised for a political career, Rajinikanth. The actor, who has repeatedly distanced himself from "saffron", has not met any leaders of the BJP either. "I will take only the good from different political ideologies," he told reporters earlier in the day ahead of the formal launch. Kamal Haasan met APJ Abdul Kalam's brother Mohammed Muthumeera Lebbai Maraikkayar in Rameswaram. In Madurai and all along the route from Rameswaram to the temple town, there are posters that depict Mr Haasan in different political roles in which his fans and supporters would like to see him. Some posters show Kamal Haasan as a second Dr Kalam, with the legend - "Kamal is a second Kalam." The choice of Madurai for the superstar's blockbuster political debut is significant; it is considered the political capital of Tamil Nadu and has a sizeable presence of Thevars, a politically significant community that has often featured in Kamal Haasan's films. Importantly for the actor, Madurai is also the town where his icon Mahatma Gandhi adopted the loin cloth. 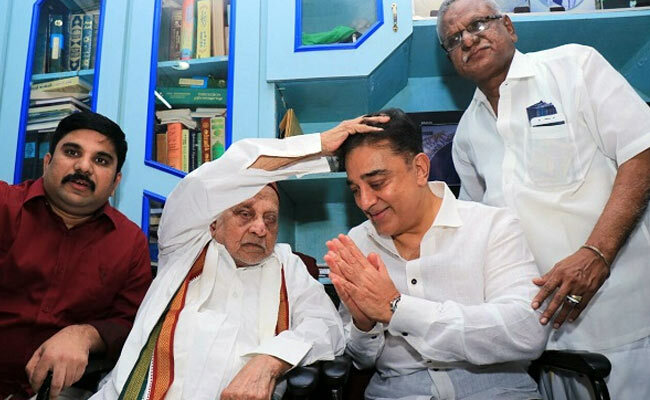 After a day spent traveling the 170 km from the home of his hero former President APJ Abdul Kalam in Rameshwaram and Paramakudi where he was born, Mr Haasan said he was coming back to these places after 45 years. "A little has changed, but my people have not. I am all of your son. You all have seen me as a movie star so far, from now I want you to teel that I am not a cinema star. I am the lamp of all your house. Please protect me and keep me lit," Kamal Haasan said there. For Kamal it's special because his hometown Paramakudi was originally part of Madurai till several districts were carved out of it for better administration. As he set off from Rameswaram to formally begin his political career this morning, he did some strategic name-dropping. Arvind Kejriwal was joining him for the launch of his new party in Madurai, he said, and Andhra Pradesh Chief Minister Chandrababu Naidu had phoned last night to say he is a fan and would have loved to attend but was unable to. It was an RSVP to an invitation for Wednesday's launch, said Kamal Haasan, stating that he has much admiration for Mr Naidu, whose ties with ally BJP are currently strained over what he calls grossly insufficient allocation for Andhra Pradesh in the Union Budget. "Kejriwal is coming. "Chandrababu Naidu called me last night. You keep asking me what my political inclinations are, I asked Chandrababu Naidu. He told me not to worry about that, the people's word will be the political inclination," the veteran Tamil actor told reporters after meeting fishermen in Rameswaram.